Well, lots going on here in Susieville! I'm knee deep in projects that I've made for 2 releases this week and still working on more! To make my day even brighter, I've got two 5 year olds over here, pretending to "spy" on me! I wonder if they've wire tapped the phones, too. I don't know if I can stand the covertness. The Witness Protection Plan is looking pretty good right now. Anyway, I aim to tease, so here's my first MFTeaser for you from My Favorite Things! 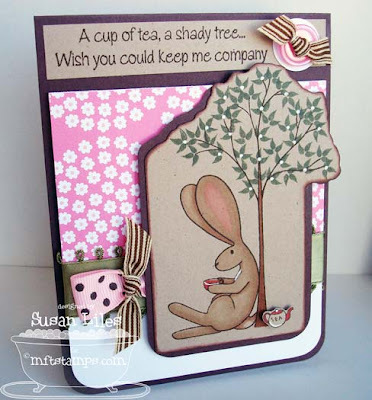 It's made with the set featuring your favorite rabbit, and it's called Tea With Flopsey . Below is all the info about the release (I hope to see you at the party!). I've got to get moving here before my little "spies" come up with a plan to overthrow me because I'm not getting their Kool-Aid quick enough. My Favorite Things is having a New Release Cocktail Party on Wednesday, March 4th from 9-10 PM EASTERN. This month there are 5 new sets being released including a Who's that Girl who is hanging with her peeps! Head over to the MFT forum on www.splitcoaststampers.com to find out all the details and to find out how YOU can be the next MFT Guest Designer. We hope to see you there on Wednesday night. SUSIE Q-TIP: The ribbon treatment on this one was made from a mistake, but I like the way it turned out even better than my original plan! I had accidently cut the pink ribbon too short to knot it onto the wider green ribbon. So I simply folded it in half and put some tape on it to stuff it behind the main panel and made it stick under there. Then I didn't like how plain that was, so I tied the brown striped ribbon sideways onto the pink. LOVE it!! I now plan to use that little trick more often! Love this Susie! The stamp set is adorable and your card is gorgeous! awww...love this one Sus!! :) And your ribbon treatment is cute and unique ;) LOVE the way your cut out the tree layer and the brown layer behind it! !